Obituary – Hartenbower, Wendell Allen « Perry High School Alumni Association, Inc.
Wendell A. Hartenbower, son of Allen W. and Elizabeth Hartenbower, was born September 3, 1907, having spent his childhood and early youth in Oklahoma City, except a brief interval in Canada attending the public schools there. In October 1924 he moved to Perry, Oklahoma, to live with his mother, now Mrs. Bush H. Bowman. After his father’s death, and before moving to Perry, he had made his home with his aunt, Mrs. Frank Best, of Oklahoma City. He attended and graduated from the high school at Perry. 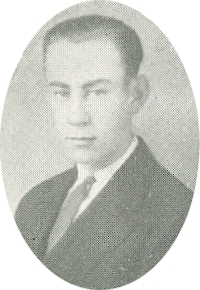 Later was a student at Shinn’s Business College, at Oklahoma City and at the time of his death was a student at the Wallace Radio Institute there. He was a member of the national Guard at Perry for about four years, and was much interested in its welfare and aims. He was also a member of the DeMolays at Perry. On May 5 he died at Perry as result of an auto accident, cutting short a life that gave much promise of a worthy and dependable man in the community. He had only recently become of age. At the age of 5 years he became a member of the Bible School of the Presbyterian Church at Oklahoma City and for more than seven years continuously attended without missing a Sunday, and was awarded a gold pin in commemoration. He early united with that church, having taken out his Church letter some time after removing to Perry, but until the time of his death had not filed it with another congregation, feeling that his location as only being temporary. Besides his mother, Mrs. Bowman, he is survived by his aunts, Mrs. Best, Oklahoma City, Mrs. A. L. Laport, Newkirk, Mrs. Frank Anderson, Mrs. Edith Ward, Mrs. Byrd Stinson, Miss Anna Hartenbower, and uncles, John and William Hartenbower, all of Douglass, and uncles James, Geo. and Claire Berger of Alberta, Canada. He was laid to rest Wednesday, May 8, 1929 in the Fairlawn Cemetery at Oklahoma City. Hundreds of friends, former classmates, members of the National Guard, and relatives paid last tribute to Wendell Hartenbower, 21 year old youth, who died Sunday morning of injuries received in an automobile accident, at the H. B. Bowman home Wednesday afternoon. Full military honors by the members of Battery C and the Regimental band of the 158th field artillery were accorded the fellow member and the procession to the Frisco station where the body was transferred from the caisson to the Fred A. Davis and Son ambulance, was a military procession. It was headed by the band playing the funeral march, followed by the color guard, the caisson drawn by six black horses and the members of the guard unit. Six former classmates acted as pall bearers, they were Leo Doyle, Alfred Trussell, Russell Harbaugh, Fred Yeager, Clare Meisinger and Wayne Folger. The body was transferred at the Frisco station to the ambulance and the procession to Oklahoma City, where burial is to be made in the Fairlawn cemetery was started. The funeral oration at the services at the house was delivered by Reverend Davis, pastor of the Presbyterian church at Oklahoma City, where Rev. George Parkhurst, pastor of the Methodist church here, delivered the prayer. A mixed quartet composed of Mesdames Edna Laird and Ira Williams, and Bert Ballard and Fred Mugler sang two numbers, “Beautiful Isle of Somewhere” and “No Night There.” Mrs. George Parkhurst sang as a solo “The End of a Perfect Day.” Edwin Bowles played the violin accompaniment for the numbers.